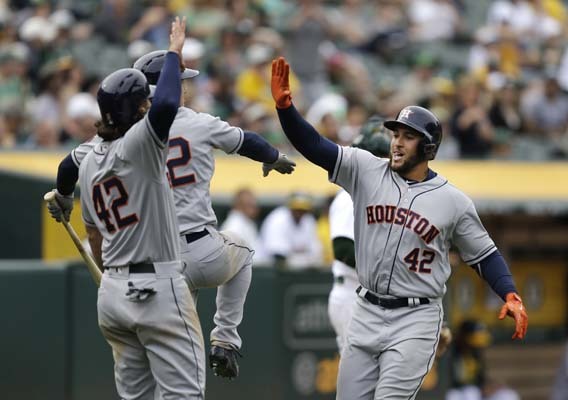 OAKLAND, California -- After being held without a hit for six innings, Houston's offense went to work. 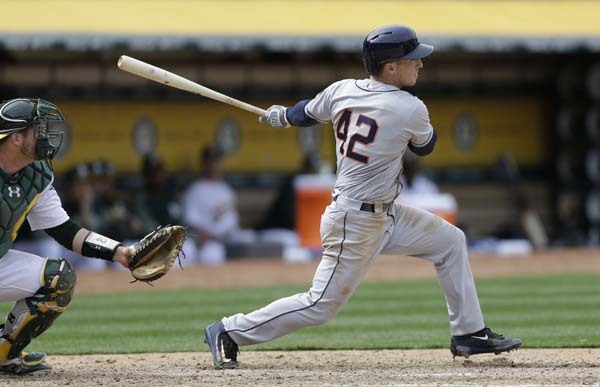 George Springer hit a two-run homer in the eighth inning after Nori Aoki put Houston ahead with one of his two RBIs, and the Astros rallied from a five-run deficit to beat the Oakland Athletics 10-6 on Saturday. 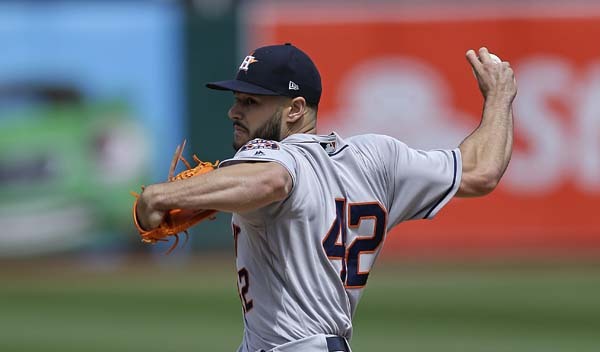 "This team has no limits," Astros starter Lance McCullers said. "This team is capable of putting seven, eight runs in an inning. That's the kind of offensive power we have." 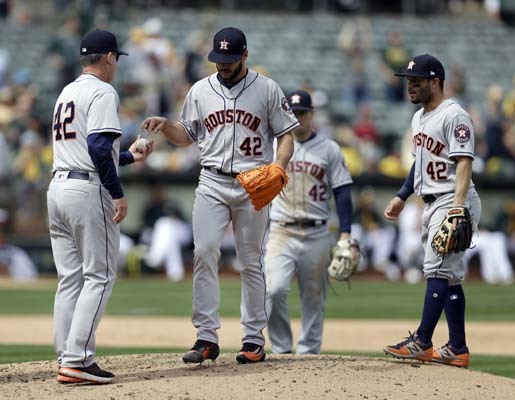 Sean Manaea and Ryan Dull combined to pitch six hitless innings for Oakland, which led 5-0 before allowing two runs on two errors in the sixth to start Houston's rally. Aoki singled against Liam Hendricks leading off the seventh for Houston's first hit and later scored on Alex Bregman's single. Springer also scored that inning on a fielder's choice. In the eighth, Josh Reddick scored on Sean Doolittle's wild pitch to make it 5-5 and Aoki hit a sacrifice fly for a one-run lead. After Jake Marisnick's infield single, Springer homered to left for an 8-5 edge. Will Harris (1-0) struck out two in a scoreless seventh to pick up the win. Santiago Casilla (0-1) took the loss. The game featured a combined 12 pitchers, 12 walks, 20 strikeouts, two costly errors on the same play and a wild pitch. "It's tough to be positive about a game like that," A's manager Bob Melvin said. "We played so well and did everything right for five innings and couldn't play any worse and did everything wrong." 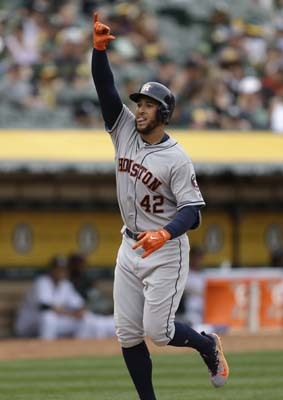 Manaea walked his first three batters in the sixth, then allowed two runs when Carlos Correa's bouncer glanced off the glove of shortstop Adam Rosales and center fielder Jaff Decker overran the ball for a second error. Manaea walked five and struck out six in five-plus innings. 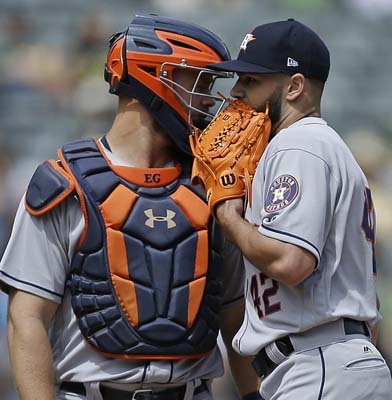 Dull struck out Carlos Beltran, reloaded the bases with a walk to Brian McCann and got pinch-hitter Marwin Gonzalez to ground into an inning-ending double play. McCullers pitched 4 1/3 innings, allowing five runs and eight hits. He walked one and struck out six. The A's started with three runs in the second, including Yonder Alonso's run-scoring double, Decker's single in his first at-bat with the A's and Rosales' successful squeeze bunt. Trevor Plouffe and Khris Davis each hit a solo homer in the fifth. McCann and Aoki each added an RBI single in the ninth. Correa left the game after being hit by a pitch in his right hand in the ninth inning. He appeared in significant pain before being visited by a trainer and exiting. Correa got an X-ray after the game, which came back negative. The team said he has a hand contusion. "Thank goodness there was no fracture," Correa said. "I didn't get a chance to get out of the way. Hopefully, it's no more than one day." Only a small number of people so far are taking advantage of $15 upper-deck seats after the A's removed the green tarps for most of the third-level seating - not including "Mt. Davis" high above center field. Saturday's game drew an announced crowd of 20,140, with a handful watching from way up high. On Friday night, the first time the tarps came off, there were far fewer. 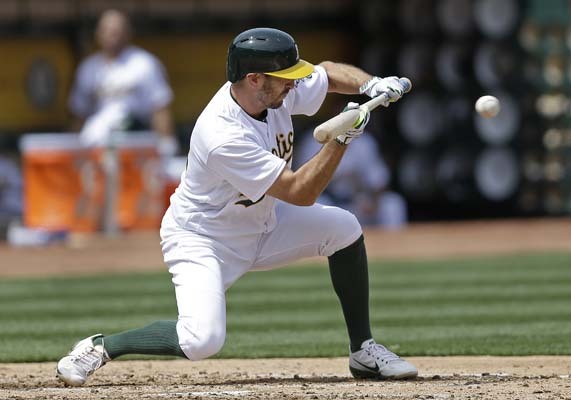 Athletics: Decker was recalled from Triple-A Nashville, replacing OF Mark Canha, who was optioned to Nashville. To clear a spot on the 40-man roster, the A's transferred Jake Smolinski to the 60-day disabled list. Decker drove in a run in his first at-bat, a single to left. He also singled in the sixth and stole a base. Canha was 2 for 19 with a double in six games with the A's. Astros: RHP Charlie Morton (0-1, 4.09) will make his third start of the season in Sunday's series finale against the A's. Athletics: RHP Jharel Cotton (1-1, 3.97) makes his third start of the year. He threw seven scoreless innings in his last outing.